Day 118: Wired is Recharged! Today was Jennifer’s last day hiking with me and it was just the visit I needed! It has been great to slow down and rest my body and mind. Each day I’ve felt stronger and more relaxed. Even yesterday, Liz saw me for the first time in over a week and immediately commented that I seemed so relaxed. I’ve just felt this way ever since I hit Oregon and I love it! The only way that I can describe it is that I feel light and swift. While Jennifer was here I was carrying some of her weight to lighten her load and it didn’t bother me at all. I was thinking that if it felt light carrying extra water and a second tent, then I can’t wait to see how light it feels when I go back to my original weight. It feels great! And my head is more clear than I think it’s ever been in my life! Being Wired, I’m usually racing with some thought or plan and that hardly happened at all today. I didn’t even think about using my headphones today and I spent a lot of the day hiking alone. I don’t know if it will last, but I feel like I’ve reached a new level in my hiking and it feels amazing! As for today’s events, we started out at 6am from the hut and said goodbye to Billy Goat. Immediately, we were smothered by mosquitoes and they were constant all 12mi into Charlton Lake, where Jennifer’s boyfriend was meeting us. Five days turned out to be just the right amount if days fir Jennifer. She was starting to have some achilles pain today after all the big miles we’d done. 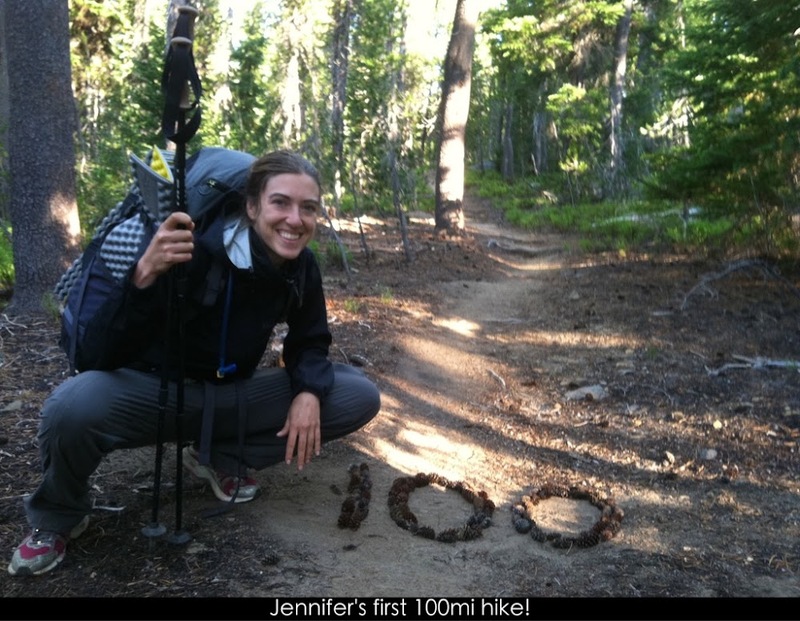 This was Jennifer’s first 100mi backpacking trip and she rocked it! When we came up on her 100th mile, I told her we’d take a break and went ahead and pretended to need to use the bathroom so that I could make a 100mi marker out of pinecones to surprise her. The mosquitoes were really bad and I knew Jennifer thought I was crazy for wanting a break. When we started up again, it was fun to see her walk up to it and suddenly realize what it was. We took a picture to commemorate this great accomplishment. Way to go Jennifer! I’m so proud of ya! 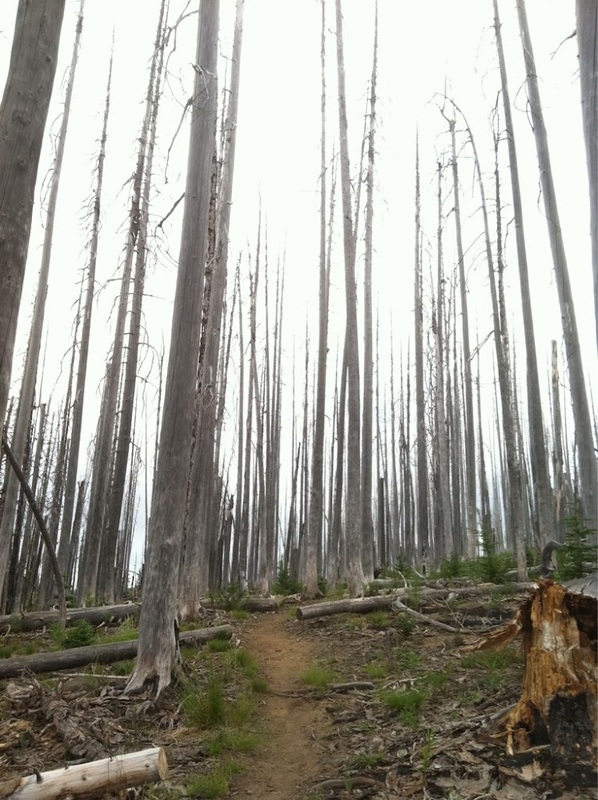 The mosquitoes were so bad, we hardly stopped at all, and we did over 12mi to Charlton Lake by 10:30am. Jennifer’s boyfriend was there with bug spray and a Subway sandwich waiting for me. Thank you Eric! I was thankful to eat lunch in the car away from the mosquitoes! After eating, I deeted up and headed out solo. The trail was amazing and I flew! It started out with a mosquito free burn section and I really liked it. 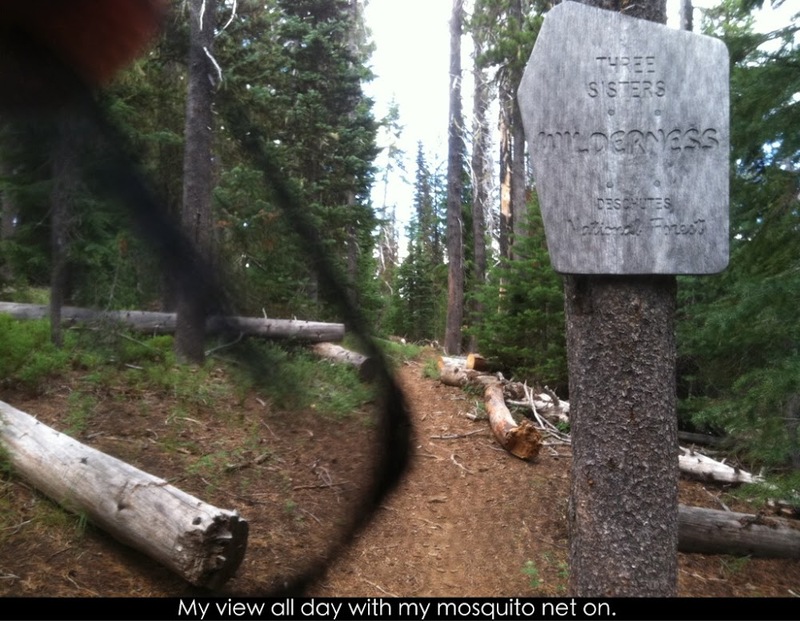 The rest of the day, the mosquitoes were really bad as I entered Three Sisters Wilderness. 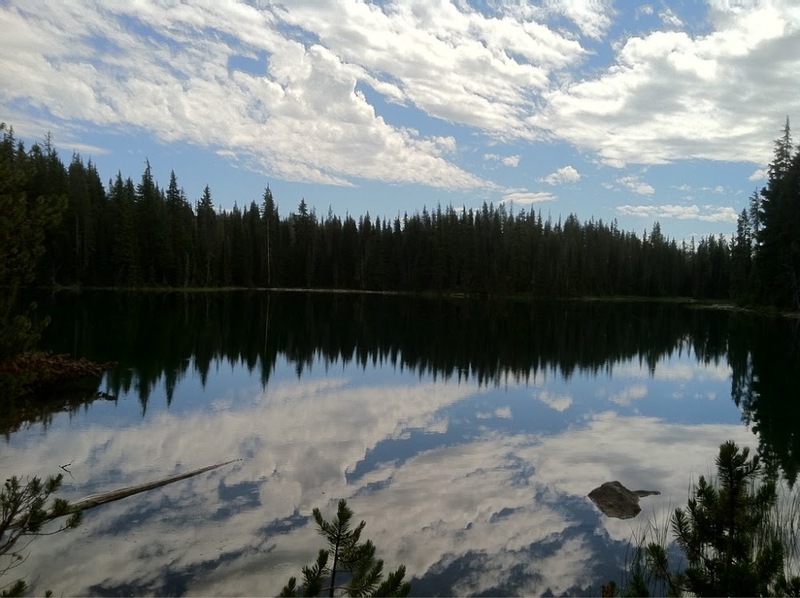 All day, I was passing small lakes and the clouds began to gather. I loved it! Then the thunder started rolling. 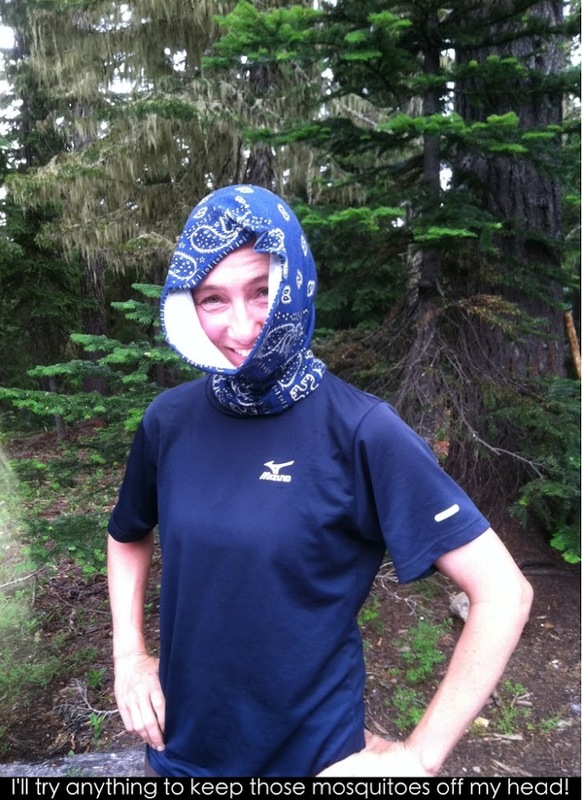 It was threatening most of the day and I got myself ready in case it really stormed. I really like my rain proofing strategy and it was good to get some practice because I haven’t had to hike in steady rain for a long period this whole hike! I don’t have a rain cover. I’ve decided to try using two trash compactor bags. One holds everything in the bag, including my tent. I also use the second one (cut 1/2 length) inside the bag and just slip it over the second one for extra protection on top to make sure it’s fully sealed. It ended up dripping on and off for a few hours and that was annoying. As evening approached, I walked up to find Dump Truck and Murphy who had pitched their tent and took a break incase the thunder turned into an actual storm. They were picking up and trying to get in a few more miles and we walked together. The thunder got closer and rain started, so we stopped two miles early to get tents up before it stormed. Darn! I just missed 30mi again! It turned out to be a good choice! 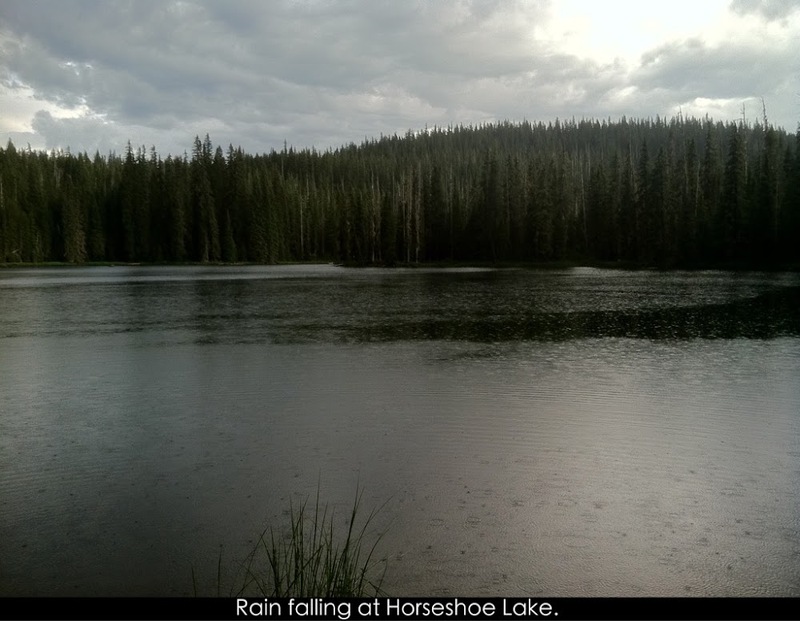 It rained on and off through dinner and we got a good lightning show across Horseshoe Lake. While we were eating, Euro Trash and LaFonda walked up and joined us. 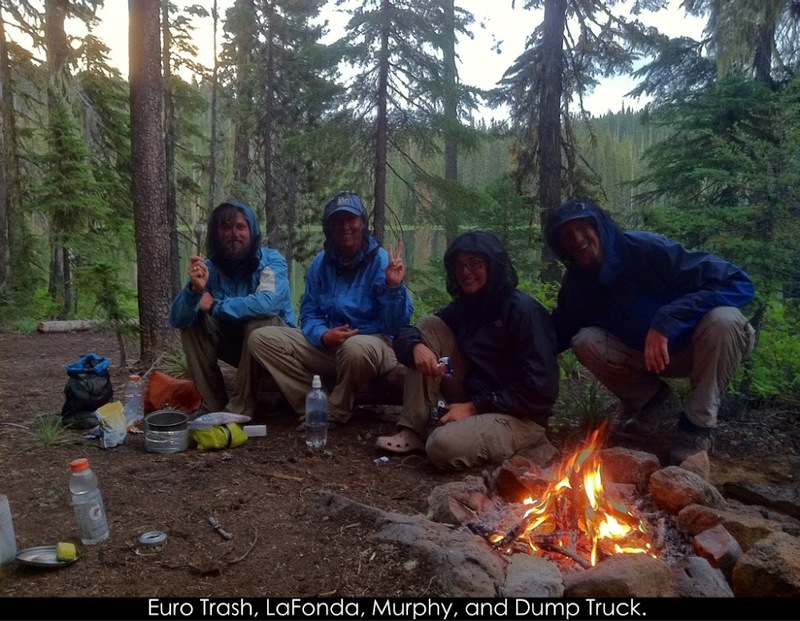 Euro Trash will be the first registered person from Finland to complete the PCT and that’s pretty cool! We made a fire in hopes of smoking out the skeeters, but it didn’t work. Those things are relentless! It started raining hard and we all went in our tents early. There is lightning flashing every now and then still, but I hope it dries up by the morning…I looked ahead and tomorrow looks like a great scenic day with the Three Sisters. Looking forward to it!